Cory Feign remembers being marooned somewhere between Mount Prospect and Chicago’s Ogilvie Transportation Center, staring out the windows of a Metra train at a drizzly little storm. When and why did Metra start shutting down the entire regional train system due to potentially severe weather? The 37-year-old rides his bike to Metra’s Union Pacific Northwest line in suburban Mount Prospect every morning, commuting to his job across the street from Ogilvie as a trader for WRN. He says in recent years severe weather warnings have screeched trains to a halt more often than they used to. At least compared to 2012, Cory is right. 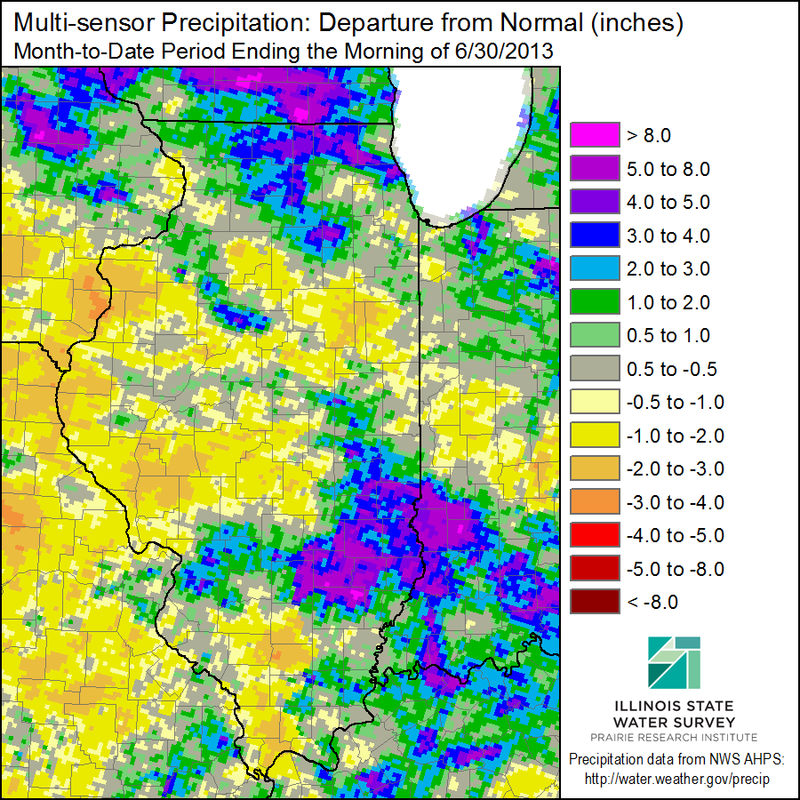 Until July this was Illinois’ wettest year to date, with parts of the state including northern Cook County, where Cory&apos;s train goes, registering big departures from average precipitation between January and June. Last year, extreme weather delayed 41 Union Pacific trains, compared to 209 so far this year. A lightning strike in April knocked out signals near Ogilvie, delaying 74 trains in one fell swoop. When we set out to answer Cory’s question, Metra spokesman Mike Gillis corrected our course right away. “Metra has not recently shut down system-wide in bad weather,” Gillis said. “What has happened, however, is that BNSF Railway and Union Pacific have stopped trains.” Burlington Northern Santa Fe and Union Pacific are independent train companies, based in Texas and Nebraska respectively. They operate the Metra lines that bear their names, while Metra operates the seven remaining lines in the local commuter rail system. BNSF, UP and Metra share the goal of keeping riders safe, Gillis said, but their operating rules vary slightly. So we asked Mark Davis, spokesman for Union Pacific. “Weather plays a huge role in the rail industry and has since its beginning,” he said. The weather service AccuWeather provides UP with national weather data, he said, but the railroad company is already well-connected. It has sensors along railroad tracks across its 23-state network that measure the heat in railcar bearings. Those sensors feed data into a master computer system, which also gets information from about 1,400 temperature stations operated by UP. Temperature swings cause slowdowns, or even put kinks in railroad switches. What happens during the rough stuff? When the weather’s bad — but not bad enough to force a full shutdown — trains slow to less than 25 miles per hour. Metra dispatchers tell trains to reduce speed when there is a weather advisory for a tornado or severe thunderstorm. High winds also pose a threat. At 70 miles per hour, wind can blow over a train car, but UP slows or stops service at 65 mph, in case there is a gust. AccuWeather currently provides wind speed information, updated every 15 minutes, but UP is rolling out its own network of wind sensors, Davis said. Right now their closest wind sensor to Chicago is in central Iowa. BNSF is working with Metra in Chicago to install wind detectors to provide real-time wind speed data along their line. During a tornado warning, all UP trains stop in the warned area and usually wait at least 30 minutes after a warning is lifted, Davis said. Metra uses similar protocol. Trains slow to 25 mph or less when there is a wind advisory above 60 mph. If wind speeds are expected to be above 70 mph, dispatchers tell trains outside the warning area to stop short as they close in, while workers inspect the track ahead. At 80 mph, or during a tornado warning, dispatchers instruct trains to stop at the first safe location and await further instructions even if they’re outside the warning area. Wind hasn’t toppled any Midwest commuter trains in recent years, but coal trains and overloaded freight cars have blown over. In China hurricane-strength winds during a sandstorm derailed an 11-car train, killing at least four people and injuring another 30. Luckily for Metra riders, such speeds aren’t common in northern Illinois. According to Illinois State Climatologist Jim Angel, wind speeds have only topped 60 about 14 times since the early ’80s at O’Hare (wind speed data is gathered at commercial airports). But wind that wouldn’t blow over cars might still rip off tree branches or bring down power lines. If a train engineer sees something on the tracks, he’ll radio back to Metra’s offices downtown. The worst disruption to area trains in recent years was the February second blizzard in 2011. Five Metra rail lines closed as more than 20 inches of snow blanketed Chicago. The other lines had to run on Sunday schedules. So what about Cory’s sense that shutdowns have become more common? Even if trains are still running during high winds and thunderstorms, he says it seems like they’re running slowly. And those delays ripple out. UP spokesman Davis likens it to O’Hare, where a thunderstorm at one airport can affect airports across the country. Cory has several friends who take a few of the other Metra lines. During delays they’ve taken to sharing notes on weather conditions and announcements from train engineers. Metra does have a Twitter feed, which announces delays and advisories as they happen. With all the different weather conditions that could slow or stop a train, Cory’s impromptu database may be at a disadvantage. But if he and his friends have service on their smartphones, they might do well to check weather maps and advisories. The people running their train sure are. Chris Bentley writes for WBEZ. Follow him at @cementley.